Eleven more homes are being painted this year (2001-2021 Wilshire) bringing us to the end of the color scheme change that started in 2009. This cycle (2009-2016) included the addition of an oil base primer (see white paint in background) that will reduce the leaching out of wax from the fiberboard which made the prior paintings look prematurely faded and streaked. If you look at the homes painted in 2009 (new color), they do not look tired and worn like the homes painted in 2008 (old color). 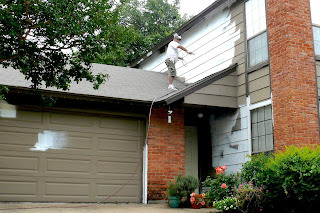 The primer will also extend the life the of the siding. This is Smith Painting's first engagement with the Association since the early 90s.